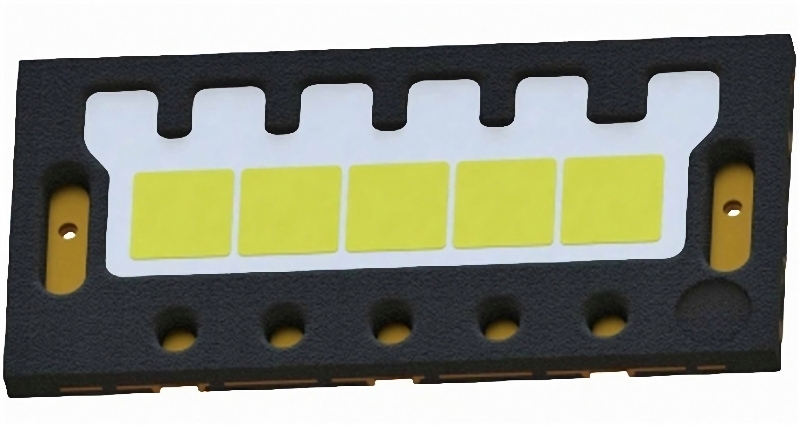 Osram Opto Semiconductors has showed a prototype of a latest Oslon Black Flat S LED chip for car headlight applications at the International Symposium on Automotive Lighting (ISAL) 2015 event in Germany. The five-emitter packaged LED can be the sole part in combined low- and high-beam headllight systems providing up to 2000 lm, and can be used to achieve glare-free adaptive headlight designs with each emitter being separately driven. The LED chip will be commercially available next year. The Oslon Black Flat family of LEDs has been developing over several years toward versions with greater lumen output realized through more integrated emitters. The company announced single-emitter car led headlight in 2011 and started commercial shipments in 2012. In 2013 the company added a two-emitter packaged LED chip. Earlier this year, the company started commercially shipping the original Black Flat S with five emitters. The latest prototype LED, however, demonstrates the performance upgrade path of the category and the developments are coming primarily in the thermal area. At the meeting, Osram demonstrated a thermal analysis (pictured below) that shows the existing product on the right and the new prototype on the left. The emitters in the current product have connection temperatures as high as 83°C while the new LED lights will max out at around 70°C. Osram said the new type will use a slightly larger surface-mount device (SMD) package that measures 3.75×7.0 mm. The thermal connection has been strengthened by larger contact pads that will enable passive cooling of the packaged LED. So the thermal design will reduce the system cost and make LED-based headlights more cost competitive with HID lights options. The five emitters provide many choices for product developers in achieving competitive headlight designs. In cases such as the US where low and high beams are required, a single packaged LED chip can realize both. In regions that allow adaptive headlights and functionality such as the Audi Matrix design, the individual control of the emitters will enable such designs. "The five chips of the Oslon Black Flat S can also be driven individually," said Stefan Grötsch, senior key expert automotive application engineering at Osram Opto Semiconductors. "The future LED light version will therefore be ideal for adaptive headlight systems."